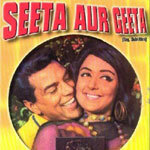 "Seeta Aur Geeta" is a 1972 hindi film which has Dharmendra, Hema Malini, Sanjeev Kumar, Asrani, Asit Sen, Roopesh Kumar, Manorama, Satyen Kappu, Pratima Devi, Daisy Irani, Honey Irani, Abhi Bhattacharya, Kamal Kapoor, Dulari, Shetty, Master Ravi, Ratna Mala, Radhika, Dev Kishan, Alankar, Keshav Rana, Mushtaq Merchant, Deepak, Suresh, Ashoo and Darshan in lead roles. We have 5 songs lyrics and 5 video songs of Seeta Aur Geeta. R. D. Burman has composed its music. Manna Dey, Lata Mangeshkar, Asha Bhosle and Kishore Kumar have sung these songs while Anand Bakshi has penned its lyrics.